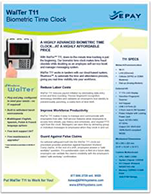 Our most affordable and compact biometric time clock with all the essential features. With WalTer T11, down-to-the-minute time tracking is just the beginning. This biometric time clock makes time fraud obsolete while doubling as an employee self service kiosk and manager messaging system.